← Birthdays, birthdays…just around the corner! My family seems to avoid the traditional summer months for weddings and instead choose to have a fall or spring wedding. That means several fall wedding anniversaries are coming up and, hey…August’s Paper Pumpkin is just what I need to make some anniversary cards. I love it when the Paper Pumpkin cards are printed on front and back because I can make twice as many cards from the kit! 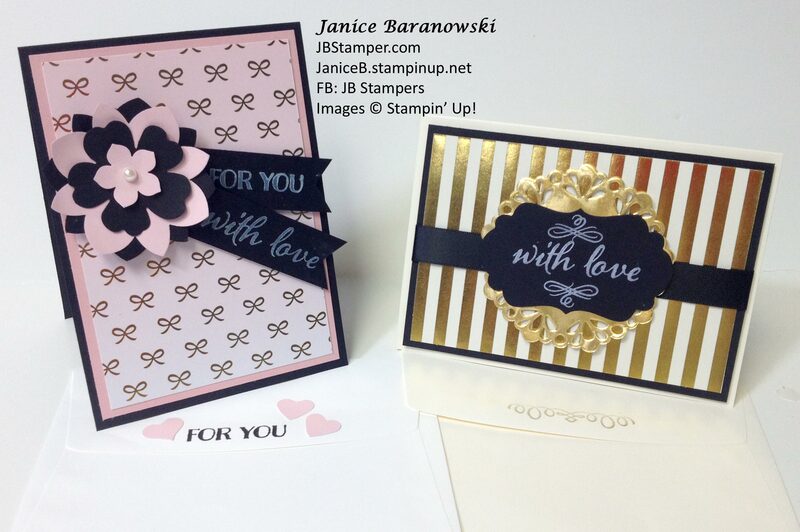 Add some beautiful Stampin’ Up! card stock, a few paper punches and you’ve got great cards! And I carried over the stamping to the back of the envelopes for an added surprise to the anniversary couples. If you are a regular Paper Pumpkin subscribers, the refill kits are still available while supplies last. If not, see Wednesday’s post about joining Paper Pumpkin and supporting Breast Cancer research! And I still have the four boxes to make and use for gifts! Such a deal! This entry was posted in Anniversary, Love, Paper Pumpkin and tagged August-2015 Paper Pumpkin, Stampin' Up!, Stampin' Up! kits. Bookmark the permalink. I love how you gussied up the basic cards! My SIL made my kit and took it with her, so I’ve been meaning to buy a couple of refills so I can put the kit together myself. The gold foiled detail on everything was so pretty. I’m having so much fun catching up on my Paper Pumpkins and creating alternatives to using them! You didn’t give a spoiler warning!!!!!! It wasn’t a “spoiler alert”, this is from August’s kit that somehow you didn’t receive! I won’t show you September’s until you have yours!